Just the social facts, ma'am: Study shows? In a column the other day, Thomas Edsall says "study after study shows that as the gulf between rich and poor widens, voters become increasingly mean spirited and hostile to the welfare state, progressive taxation and regulations designed to protect consumers, workers and the environment." I glanced at the studies he cited, and none of them seemed to show that, so I turned to the General Social Survey. It has a number of questions about whether spending on various national problems should be increased, reduced, or kept at about the current level. The ones that seem relevant are "improving and protecting the environment," "solving the problems of the big cities," "Social Security," "improving and protecting the nation's health," "improving the conditions of blacks," "welfare," and "assistance to the poor." There are also two more general questions. 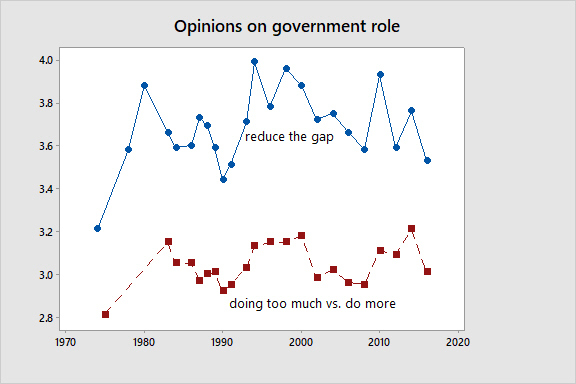 One asks people to place themselves on a scale between "the government in Washington ought to reduce the income differences between the rich and the poor, perhaps by raising the taxes of wealthy families or by giving income assistance to the poor" and "the government should not concern itself with reducing this income difference between the rich and the poor." The other is a scale between "the government in Washington is trying to do too many things that should be left to individuals and private business" and "the government should do even more to solve our country's problems." The gap between rich and poor started growing at about the same time the GSS started (the mid-1970s), so Edsall's hypothesis implies that opinions should move steadily in a conservative direction. I coded all of the variables so that high values mean more conservative. 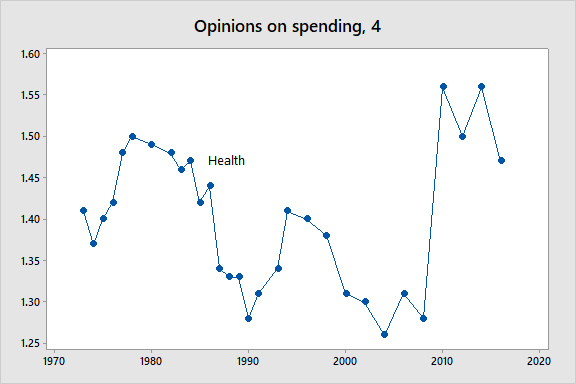 Here are the average opinions by year. First, welfare and aid to the poor (which were asked of randomly selected halves of the sample). No obvious trend for either one. 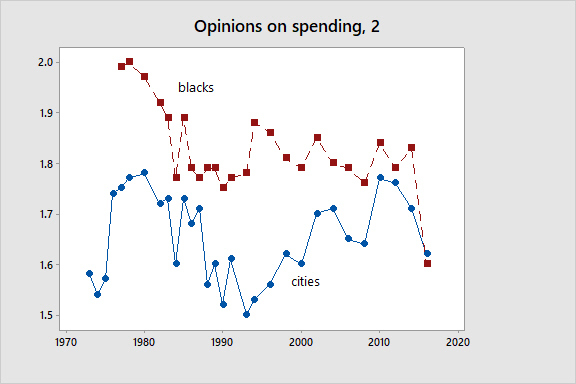 Next, the conditions of blacks and the problems of the big cities. On spending to improve the conditions of blacks, it looks like a trend towards support for more spending, with an unusually large move from 2014 to 2016. On "the big cities" there are ups and downs with no obvious trend. 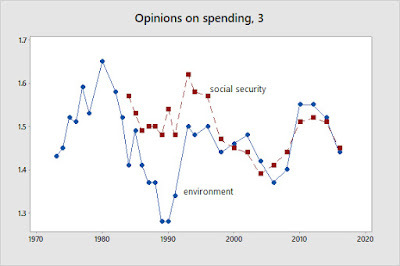 People generally support spending more on the environment and social security (in the scale on the left, 3 would mean everyone favors spending less, 1 would mean that everyone favors spending more, and 2 would mean equal numbers favor spending more and spending less). It looks like there might be some trend towards favoring more spending on social security. 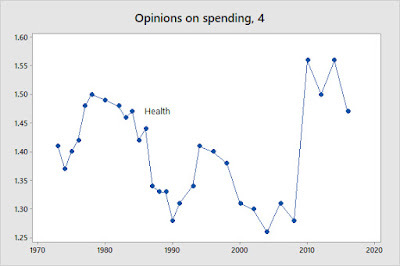 Opinions about spending on health show a distinctive pattern: a trend towards support for spending more through 2008, and then a sharp move in favor of spending less. The reason for that seems pretty obvious: "Obamacare" was passed in 2010. It looks like there was a more in a conservative direction in the first few years, from the early 1970s to the early 1980s, and no obvious trend since then. Opinions on these questions generally are more conservative when a Democrat is president, and more liberal when a Republican is, which makes sense since all of them refer to the way things are as a baseline. If you regress each on a dummy variable for the party of the president and a time trend, the estimate on the time trend is negative and statistically significant for spending on the environment, social security, conditions of blacks, welfare, and aid to the poor, and not significantly different from zero for the rest. 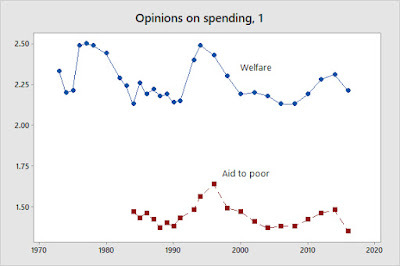 So in general, it seems that people have become more generous and accepting of the welfare state during the period of rising inequality. This raises a number of questions which I don't have time to address now, but will get to soon.